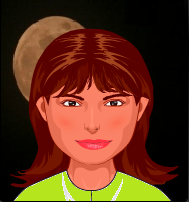 Melody, age 42, is the mother of the main character in a story concerning the near-future of life on Earth and other planets. She was a NASA scientist who was offered a special compensation package with the closing of the national space program in favor of an international pod of young scientists who are being housed in a dome in Virginia. In anticipation of colonizing Mars, NASA scientists’ children are invited to live at a special boarding school that trains them as the first colonists. There is one caveat: The children’s memories of their families are wiped to eliminate “old world” thinking on the new planet. Melody created a hack she inserted in her daughter to restore her family memories when her daughter reaches adolescence. Melody was part of a space program and was working in genetic modifications when she began to notice that the polluted air of increasingly radioactive Earth was interacting with the genetically modified plant life in such a way as to cause the plant life of Earth to rapidly die off. Her apocalyptic predictions of the future, corroborated by the findings of her peers, earned her the maligning label of “tree prophet”. 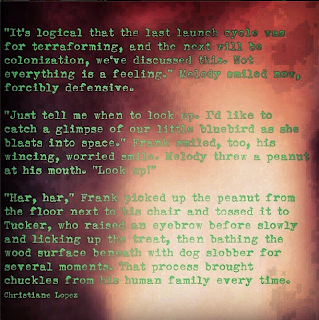 Melody and her husband Frank, an astrophysicist from Japan, embraced the label and call themselves the Tree Prophets, as they try to solve the riddle of prolonging quality life on Earth outside the colonist boarding school dome until the time when (hopefully) third wave colonists will be invited to Mars. When we meet Melody, her daughter has been at the training school for several years, and Melody has reason to believe the time has come for her daughter to go to Mars. She can only guess, as there is no contact between the school and other civilians. She does not trust the government, but wants what is best for her daughter, especially life in an environment that does not cause her lungs to fill with poison leading to illness and death, as is common outside the dome. The Tree Prophets have cannibalized the old NASA stomping grounds outside of Titusville, Florida and are developing all sorts of technology in an effort to increase the quality of life for humans essentially abandoned on Earth. The east coast of the US is the safest place remaining on Earth and home to the elites and dignitaries also housed at the dome, further enforcing the covert behavior of Melody and her friends, who live on a science ranch of sorts on the Space Coast only a few hundred miles south. Four sandboxes exist in the story, but Melody’s home is the only one she can access, while her daughter will experience all four as the first main character of the story. Melody has separate housing with her husband and dog, as part of the ranch compound which is home to several other scientists. Their projects include a community branch which Melody heads up that is responsible for food development and experiments in encouraging a canopy of new plants that will provide better air quality. Religion and the arts are marginalized due to the intense focus on its mission, but the community has grown with the birth of a few children, which may be considered the first healthy generation on Earth in many years, thanks to Melody’s work with genetics and plant life. Her quest to stave off human extinction while awaiting a planet transfer is showing promise. Melody quickened. Out of the corner of her eye, she saw something flitter past the window. She chased it with her gaze and and found it was a blowing leaf. But it had hovered like a bluebird if only in her mind’s eye. “It’s logical that the last launch cycle was for terraforming, and the next will be colonization, we’ve discussed this. Not everything is a feeling.” Melody smiled now, forcibly defensive. “Just tell me when to look up. I’d like to catch a glimpse of our little bluebird as she blasts into space.” Frank smiled, too, his wincing, worried smile. 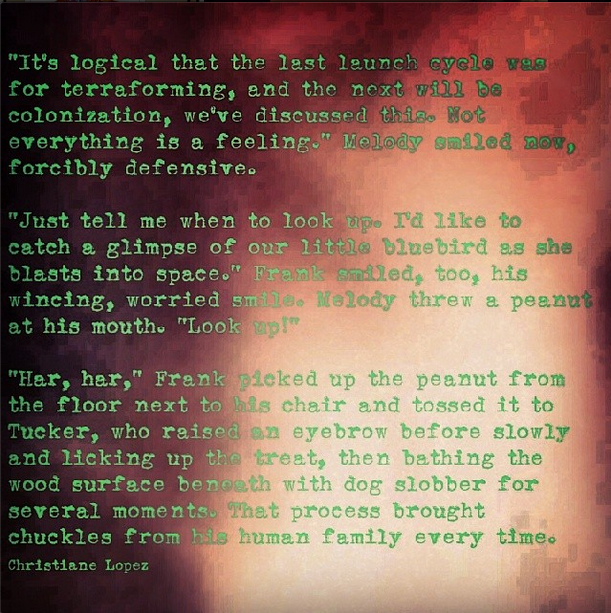 “Har, har,” Frank picked up the peanut from the floor next to his chair and tossed it to Tucker, who raised an eyebrow before slowly and licking up the treat, then bathing the wood surface beneath with dog slobber for several moments. That process brought chuckles from his human family every time.